Description: Erect shrub to 3 m high, ± glabrous or stems and often lower surface of leaves pubescent. Leaves opposite or almost so, ovate to narrow-ovate in outline, 2–10 cm long, 10–30 mm wide, upper surface reticulate and shining, margins irregularly lobed, sometimes 3-lobed with each lobe pungent-pointed; stipules spinose, curved, 1–3 mm long. 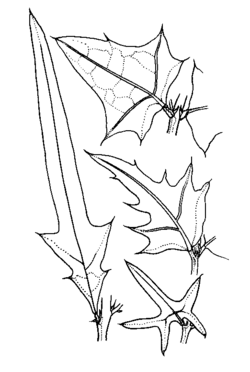 Racemes terminal or axillary, sometimes exceeding the leaves; bracts small, ovate to lanceolate, caducous; bracteoles absent. Calyx 4 mm long, pubescent. Corolla 8–10 mm long, yellow with orange markings or orange-yellow. Ovary stipitate; ovules c. 4. Pods ovoid to oblong, c. 10 mm long, 2–3 mm diam., straight or curved, ± pubescent. Flowering: Flowers spring to early summer. Distribution and occurrence: Widespread in dry or wet sclerophyll forest on sandstone or clay.